A young boy wakes up on a Wednesday to discover everything around him has gone completely wacky. His shoes are on the walls and ceilings; there’s a palm tree in the toilet; his teacher is wearing roller skates; he even sees a pig with chicken legs! Children will have great fun searching for and counting all the wacky things on each page. Wacky Wednesday is an interactive book that not only suits beginner readers, but is also a fun story to read aloud to younger listeners. The story is written in short rhyming sentences and encourages children to find an increasing number of semantic absurdities on each page. It’s basically a whole book of “what’s wrong with this picture?” pages, which is great for developing children’s language skills as they describe what they see on the pages. The book provides frequent models of the subjective pronoun ‘I’ (e.g., “I was late for school. I started along. And I saw that six more things were wrong”), so it could be a good choice for children who struggle with this pronoun. It also contains lots of words beginning with /w/ for children who are learning about this sound. 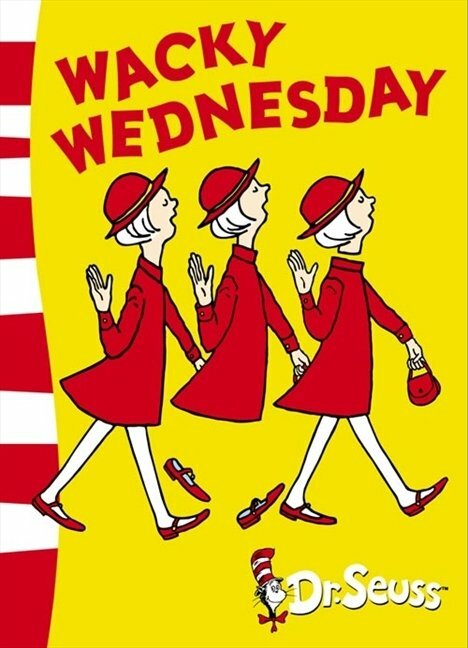 For further speech and language goals to target using Wacky Wednesday by Dr Seuss, please see the list below.